13-23" TV size guide is a recommendation only. 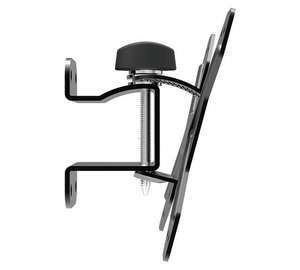 PLEASE CHECK YOUR TV's VESA MOUNT PATTERN TO ENSURE COMPATIBILITY Turn and tilt action for more flexible viewing. TV screen can be positioned to avoid screen glare and reflections, Tool-free adjustment of tilt action, Easy slide-on installation. Turn and tilt action for more flexible viewing. Suitable for flat TVs from 13in to 23in. VESA compatible mount with 100x100mm spacings (horizontal x vertical distance between mounting holes on the back of the TV).